Need an example that "the good old days" were not always what they were cracked up to be? 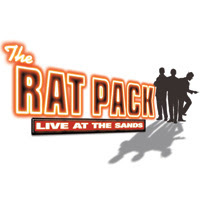 Well, The Rat Pack: Live At The Sands import from the U.K. currently touring the United States makes for an excellent case study. Not content to let them rest in peace, the revue-style show from director/choreographer Mitch Sebastian "teams up" Frank Sinatra with Rat Pack alums Sammy Davis, Jr. and Dean Martin one more time, I suppose, for posterity's sake. On the positive side (and it's not just an incidental positive, either) is Sinatra doppelgänger Stephen Triffitt who not only sounds just like Ol' Blue Eyes, but looks so much like him that you believe you're actually watching the Real McCoy. David Hayes evokes Davis fairly well both in song and dance. And although Nigel Casey looks and sounds little like Dino, he sure has enough charm and charisma to win the crowd over. All three provide terrific voices to their characters' array of top hits and standards. But when it comes to the bantering among the three, we're stuck in a real time warp -- especially in the joke department. While Ku Klux Klan jokes were never, ever funny, unless the jokes were on the KKK themselves, we're fed more than one aimed squarely at the Davis character. On top of that, misguided humor seriously backfires when the objects of derision are Jews, alcoholics and gays, to name a few. Was this really the shtick that our parents found so hilarious? Apparently so, given the standing O this show received from the decidedly older, but hardly mature audience. As much as I enjoyed the timeless music and great impersonations, this was one offensive trip down memory lane that served as a reminder that the good old days weren't necessarily so. Yikes, an evening of music and bigotry! I'll have to avoid this show when it comes to a theater near me. I was looking around to see whether any other reviewers had mentioned the offensive jokes. I found one, but it was more in the vein of, "Oh look, they've even kept in all the politically incorrect bits." I did find an interesting radio interview with Shawn Levy, who wrote a book called "Rat Pack Confidential." As you related, he said that the joking, much of it directed toward Sammy, was extremely offensive and just makes you cringe to hear it today. (Actually, it should have made people cringe then, too). Apparently, in his autobiography, Sammy Davis Jr. wrote about realizing that there was a double edge to the humor but justified it by saying that Frank had always stood behind him and thinking, well, this is shtick, this is what we do, it's part of an act. His wife wasn't as forgiving, and thought his treatment was terribly demeaning, which it was. As the sixties wore on, the act became increasingly difficult to take, and contributed to the Rat Pack's declining popularity. But in the day, the jokes apparently just brought down the house. Of course, that doesn't explain why they're still bringing down the house in 2007. This show would have been so much better had they left some of the worst jokes out of the show. I saw this show at the Wilshire and it was great. The people here still know how to laugh at a joke. The show took us back to the good old years of stage shows when people still could laugh at themselves. Stupidity, I think the performances, particularly by Stephen Triffitt, were pretty amazing. But I take a very dim view toward racist, anti-Semetic and homophobic humor. It's not funny. It's not so much people still laughing at themselves as it is laughing at other people. It's amazing how sensitive people are today. I really am sorry you found the jokes so offensive, Steve. Maybe next time they should make the show more politically correct for people who might walk out of the the theatre sobbing because their feelings were hurt by the jokes. I believe that racism, anti-semitism, and homophobia are bad but bringing a sense of humor and leaving the stick up your *** at home might help you better enjoy the entertainment provided by such a great show. Tad, I'm hardly sensitive, thus my moniker, but the show could have been superb without wallowing in dated humor that is flat-out offensive by today's standards. Was it necessary? No. I have not seen the show yet, but I am going to have to agree with Tad here. This will most likely make you cry but it needs to be said. Steve, I think you need to grow a pair. Cassandra, Bigotry is never funny. Sorry. Is Broadway Buzz Pure Follies? Were Critics Faithful To Betrayal?